The ESS M54B30 TS1 series system is equipped with a Lysholm Twin Screw supercharger which has several advantages over the centrifugal compressors used in earlier ESS M52TU/M54 systems. It creates a higher boost-pressure at lower engine rpm, thus significantly increasing bottom and mid range torque. Lag time during shifts and on-off throttling are reduced to a minimum and the throttle response is incredible. The twin screw principle is also highly energy efficient, which contributes to the extreme power and torque output of the ESS TS Series systems. The system also utilizes a throttle body type butterfly air bypass valve to reduce SC parasitic drag and increase fuel economy during cruising conditions. The entire ESS TS system consumes less than 2hp during cruising and it is very energy and heat efficient. The overall system efficiency, torque delivery, power production and room for higher power stages is considerably higher than that of any competitor. The Twin Screw supercharger is the only product on the market today to combine both a positive displacement design for maximum low-end torque and highly efficient top-end horsepower output. Also emission levels at high speed and boost are lower than with other turbo and supercharging systems. The redesigned ESS MS43/45 engine control software is perfectly calibrated for the TS supercharged engine providing optimum ignition timing under all conditions, recalibrated EGas for quicker throttle response, recalibrated VANOS control and perfectly optimized fuel delivery supplied by the 6 larger Bosch fuel injectors included with the kit. The software also features a 6800RPM rev limit and removed top speed governor. The system maintains all OBD-II functions and it is backed by a comprehensive 2 year, unlimited mileage warranty program. The system installs in 6-8 hours using normal hand tools and no irreversible modifications to the car is necessary. -Custom ESS Spec Lysholm 1.6L Twin Screw supercharger unit. -High strength, dual-layer cast aluminum alloy ESS intake manifold. -Uni-belt SC drive system with additional OEM quality idler pulleys. -6 larger Bosch fuel injectors. -Throttle body style butterfly bypass system for superior fuel economy during cruising and optimal throttle response under all conditions. -Perfectly optimized, dyno tweaked MS43/45 ECU software. -CNC hard anodized brackets and hardware. 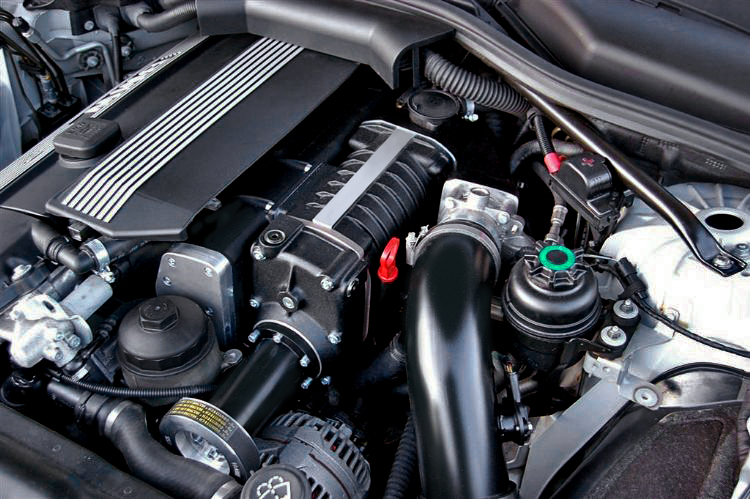 -Cast aluminium SC intake system with crankcase fume reduction system designed for boost. -High temperature, custom made silicone hoses with clamps throughout the system. -Detailed, step-by-step installation manual -Heavy-Duty drive belt. -All required installation hardware included -2yr./unlimited mileage warranty. ESS TS Series superchargers gives you the best of both worlds with instant boost, true industry-leading torque AND throttle response, while the ultra high efficiency of the twin-screw gives you maximum top end power. The TS1 is fully upgradeable to TS2 and TS3 and comes with the chambers for the Laminova based liquid intercoolers machined in, so if you ever decide to upgrade to TS2 or TS3 it can be easily retrofitted as part of the upgrade package.